With a population of just over 30,000, you might not think of South Kingstown as a hotspot for artists, but with five different galleries within its 57.1 square miles of land, it is just that. 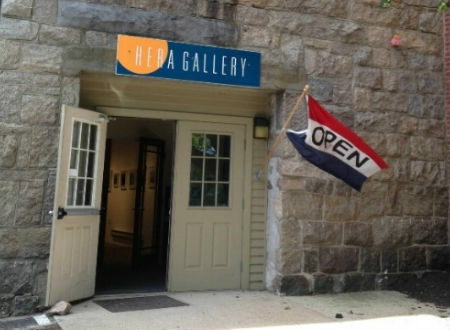 Several of these galleries allow local up and coming artists to display their work or learn new techniques, while others provide a space where art lovers who might not be as gifted to select pieces for their home or office. The result is a quickly developing artistic hub on Rhode Island's south coast. Right in the heart of Wakefield on High Street sits Hera Gallery, the country's fifth-oldest women-founded project art space. The gallery provides a valuable service to South County because it gives lesser-known artists a chance to have their works displayed. This non-profit gallery has been in business since 1974 and acts as a venue for artists to not only show off their work but also engage in the artistic community. The venue has various exhibitions throughout the year, including those dedicated to young adults and children, helping to usher in the next generation of artists by giving them a chance to express themselves. Lectures, film screenings, and gatherings are also part of the calendar at Hera Gallery, so its offerings are about art as a whole, rather than just physical renderings. The Quo Vadis Shopping Center in Wakefield is home to Picture This Framing Center & Gallery, a unique business that will frame and preserve artwork or prints that you already own, and also has a gallery full of great paintings that you can purchase. Browse the gallery, and you'll likely find a beautiful piece to take home with you, or commission the staff to create a work of art for you. The main focus at Picture This Framing Center & Gallery is finding the right frame and background for whatever print you bring in, making the custom job they create a work of art all its own. Customers take everything from family photos to military medals to the staff here to have them immortalized through their one-of-a-kind framing services. 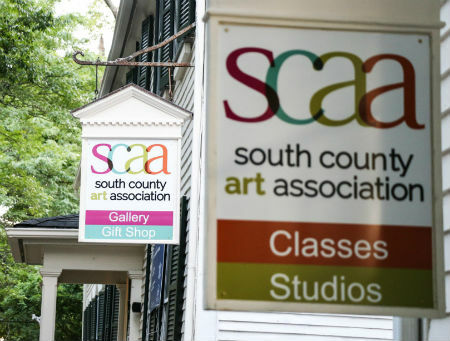 You'll find a rotating schedule of exhibits at the South County Art Association Gallery, which has been around in one form or another since 1927. Some displays at the gallery feature the artistic renderings of the association's members, while others are made up of open juried competitions that any artist can enter. There is even a unique exhibition where works completed by students of the classes offered in the gallery's studio are on display to the public. Those who are interested in seeing the best of what South County and the rest of Rhode Island's art community has to offer should take the time to stop by the South County Art Association at some point. Check the schedule on their website to see which exhibits or competitions are taking place today. Located at 446 Main Street in downtown Wakefield, The Glass Station features a selection of fused, blown, and cast glass items from both regional and local artists. Handcrafted jewelry is also available at the storefront, and makes an exceptional gift for that special person in your life, especially since it's a one-of-a-kind purchase. The Glass Station doubles as a studio, as well, so you can learn how to make your own blown glass Christmas ornaments and paperweights or take a glass fusing class. The classes only run if enough students sign up, so you'll want to register early and tell your friends. If you have an interest in glass artwork, this is the place to go in South County. Fayerweather Craft Guild isn't like the other art galleries on this list, as it is more of an artisan craft shop where you can pick up items created by 45 individuals who practice traditional methods of making these articles. The shop sits in Fayerweather House in South Kingstown, which was built in 1820 and is on the National Register of Historic Places. You'll find some great pieces of art when you visit, albeit on a smaller scale than other galleries mentioned here, and there are classes where you can learn the traditional methods of creating these time-tested crafts. Keep in mind that the shop is only open from May until Christmas Eve, before closing for the rest of the winter, and they haven’t updated their website since 2012. You can, however, check out their Facebook page for up to date information. If you’re looking for some artwork to put up in your home, why not choose something from a local artist? Not only do these artists appreciate you investing in their careers, but this is also an easy way to pick up an original piece. Or, if you're in the mood to create some art on your own, try taking one of the classes at these artists' studios. South Kingstown has numerous options for art lovers, so get out there and experience them today.